Predictive and real-time irrigation data for specific crops. Throughout rural Australia, irrigation water usage and demand management is the cornerstone of many agricultural and pastoral enterprises. In our cities and regional centres, the demand for green lawns, lush gardens and public green spaces remains a priority, despite best efforts to encourage planting of drought-tolerant vegetation. Our steadily increasing population places growing demands on precious and often unpredictable water resources. Urban development brings with it more sporting facilities, public spaces and memorial parks. These developments often rely on some irrigation to maintain the robust and healthy condition of turf and vegetation. Since the earliest days of irrigation, engineers and systems developers have pursued the best approach to deliver the right amount of water when and where needed. Until recently, intuitive systems that sense a water demand and act to deliver metered flows has been a challenging task. All that is changing rapidly with the advent of fast, cloud-based data management, the Internet of Things (IoT) and applications based on wireless and Bluetooth technology. Data capture, sharing and applications have become very sophisticated, used in virtually every aspect of our lives. Emergency response, building management, and residential appliances all now have the capability to be controlled automatically, and globally by remote, and with minimal human intervention. Irrigation is no exception. 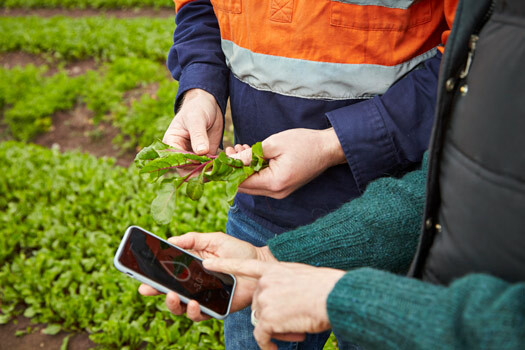 Systems that use the latest and emerging data management technologies are capable of managing irrigation from anywhere in the world by using smartphone apps, tablets or web browsers connected via cloud software. These technologies have made it possible to implement predictive watering schedules that are based on real time or forecast temperature, rainfall, wind and humidity to deliver maximum water savings, while maintaining healthy conditions for commercial or public space vegetation. Many of these operate with meters that automatically report broken pipes or other leakage incidents. Irrigation contractors are being introduced to water management software and systems where users such as large commercial growers or pastoral companies can use predictive watering adjustments that make significant cost savings by efficient water usage. This data also avoids wastage by over-watering and enables zone selection to adjust water dosage to areas with a priority water demand. Today, most centrally controlled irrigation systems can monitor and adjust an individual program based on data collected from evapotranspiration and flow sensors. These systems provide feedback that triggers automatic adjustments to be made or can shut down zones if a pipe or fitting break has been detected. For reasons of cost reduction and concern for water conservation, local governments are embracing technology for controlling irrigation water usage. For example, in water-poor Western Australia, more than twenty local government jurisdictions have opted for data-driven automatic irrigation systems to maintain sports fields and other public spaces. The system being used includes private network weather stations that collect data, which is transmitted by modems to a proprietary hosted cloud server that in turn, transmits to the irrigation flow control devices. The system has been designed to allow potentially hundreds of controllers to be linked to the cloud-based software. The technology permits monitoring of water usage, capture volume and runoff levels. It records water usage from water meters and has the capability to report daily, weekly or monthly usage. Today’s systems are becoming more intuitive, and thanks to secure cloud-based servers, are able to respond instantly to meteorological conditions. The system can be managed via a free App which is compatible with all mobile devices. Some systems have technology that allows constant communication and integration with controllers and field devices, include rain and moisture switches, water meters and frost sensors, including measurement of evapotranspiration. Growers are beginning to benefit from distributed in-field sensor-based irrigation systems that promise a potential solution to support site-specific irrigation that allows producers to maximize their productivity. Dramatic improvements in water use efficiency have been achieved from developments in variable rate irrigation, comprising a wireless sensor network for real-time in-field moisture sensing and control of site-specific linear-move irrigation systems. 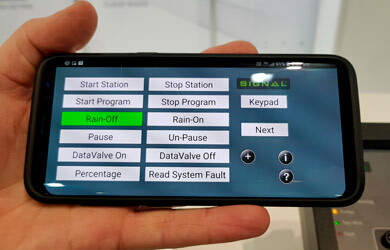 Emerging digital irrigation control systems suppliers are starting to provide integrated systems that combine sensors, analytical and user-friendly apps that bring data within the reach of any enterprise that relies on real time or predictable information to calculate water demand. Some of these latest systems operate independently of generic weather data, as public service material is usually not sufficiently detailed for specific crop types and their daily variable and real-time microclimates. There are systems that provide a mix of artificial intelligence and machine learning which is applied to specific microclimate weather forecasting. Some can manage data such as the crop variety and its growth stage, informing the grower if irrigation is needed to provide the optimum moisture content. Most agricultural systems still require a level of human intervention, however the day is approaching where data collected can be digitally analysed and interfaced with electro-mechanical devices that will activate the irrigation mechanism to deliver water on demand. Like many technological innovations that have evolved from success in commercial or industrial markets, affordable digital controls are starting to appear for the consumer irrigation market. 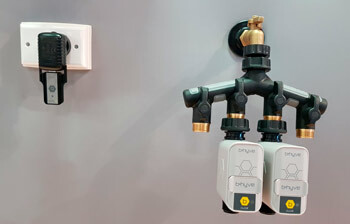 Specialist suppliers to the irrigation contractor and residential landscape markets are beginning to offer fully integrated systems, some of which will appear in retail stores by the end of this year. These include advanced irrigation systems, right down to tap timers controlled by local Bluetooth connectivity, and where internet modems are installed, by wi-fi. These tap timers are also equipped with water meters, so residential and strata owners are able to monitor water usage. Many people already have a broad understanding of smart watering systems and are ready to use the technology, as everyone wants to save water, time and money. As the adoption pace of digital irrigation increases, we are also seeing more powerful multi-outlet systems being released. While many residential or DIY systems do not yet have moisture or humidity sensors, some operate on data used to calculate water for zone selection, slope, turf, annuals, desert vegetation, trees or shrubs, different irrigation devices such as spray, drip line, amount of shade and the number of sprinklers, together with their spacing and coverage. Additional data for residential installations is provided by some companies via a network of private linked suburban weather stations that produce information that is very specific for local microclimates. These weather stations that form part of an integrated service analyse local meteorological conditions, including time of day, cloud cover and precipitation, and transmit data via a free smart watering software App that gives users total control of the residential irrigation system, regardless of where in the world they may be at the time. These systems have the ability to automatically adjust the watering program, without human intervention, but will still allow manual override if necessary. Despite their complexity in terms of data, the App makes their use quite simple, or as an option, the supplier offers a remote monitoring service. 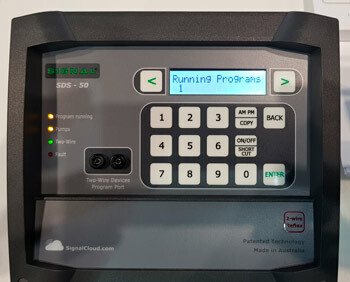 More information on digital management and apps for irrigation systems may be found by visiting sites such as www.sentek.com.au, www.signal.com.au/software and https://bhyve.orbitonline.com/.